Now I must say that I don’t get excited when I meet rock stars and other celebrities… I guess that I’ve gotten a little jaded over the years. It’s just not a big deal. This Friday showed me that I can in fact get all giddy when meeting someone. I had the pleasure of meeting Junior Johnson ! One of the most colorful characters in the history or NASCAR. Since I was dressed for the Busch Series race later that night at the Lowes Motor Speedway… I was wearing my Jim Beam Black Robby Gordon t-shirt. Junior was there to talk about his Midnight Moon and Catdaddy brands of liquors. Faux pas! I didn’t know that Mr. Johnson was going to be there… It was a great surprise! I did get my picture taken with him and that was a big thrill. I just covered up the Jim Beam Black logo. --I still had Thursday’s smile on my face on Friday… And I finally met up with Kristina with coolers and a small box of wine. She purchased some other smaller boxes of wine at her neighborhood convenience store. She can’t drink beer and I’m not drinking it for the month of October. So wine would have to do. Then we hoofed it over to Catey’s place to meet up with everyone else. Catey’s cat Knee high… Is like the tallest damn cat that I’ve ever seen! I wouldn’t be surprised if that cat was once scouted for the NBA! That joker was literally “knee high”. We left in tandem with Catey leading the way down south towards the Mecca of stock car racing… Lowes Motor Speedway. We got parked and immediately pulled out the chairs and coolers with the precision of an Army drill team. There were no wasted movements. The four of us moved in perfect harmony with one goal in mind… Intoxication. We sat and chatted while Catey called in the guys with the golf cart. They were kind enough to pick us up and cart us over behind turn 2 of the Speedway. Believe me… Walking that distance would have taken at least 45 minutes and a good amount of blistered skin. I can’t remember their names, but that one guy drove the cart like he stole it. If you placed a orange-sized lump of coal on my sphincter… You would have a gotten a very small diamond after a ride with that guy. Jeez! I had to fill out more paperwork to get into the pits and after that, we stopped by a motor coach home that belongs to a crew chief of a Busch Series car. Very snazzy joint! 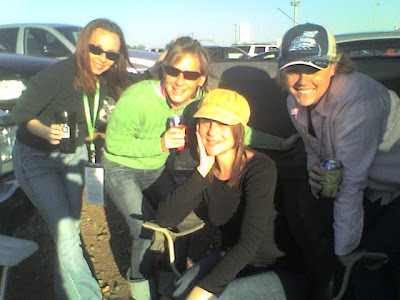 Then we were driven back to our tailgating area where Kristina had easily made friends with Kira and Gina (Deadhead). From left to right… Kristina, Gina, Kira, and Catey. Stay tuned… I’ll finish the rest tomorrow. No beer in October? Say it isn't so!!!!! One word: Octoberfest! Some of the most wonderful seasonal brews are only sold during this fine month. It won't go unnoticed. And next time I'll buy some brews for you.